The absence of anti-cytomegalovirus (CMV) immunoglobulin G (IgG) is used to classify pretransplant patients as naïve for CMV infection (CMVneg patients). This study assessed whether pretransplant CMV-specific T-cell immunity exists in CMVneg patients and whether it protects against CMV infection after kidney transplantation. The results show that CMV-specific CD137+IFNγ+CD4+ and CD137+IFNγ+CD8+ memory T cells were present in 46 and 39% of CMVneg patients (n = 28) although at much lower frequencies compared to CMVpos patients (median 0.01 versus 0.58% for CD4+ and 0.05 versus 0.64% for CD8+ T cells) with a less differentiated CD28-expressing phenotype. In line with these data, CMV-specific proliferative CD4+ and CD8+ T cells were observed in CMVneg patients, which significantly correlated with the frequency of CMV-specific T cells. CMV-specific IgG antibody-secreting cells (ASC) could be detected at low frequency in 36% of CMVneg patients (1 versus 45 ASC/105 cells in CMVpos patients). CMVneg patients with pretransplant CMV-specific CD137+IFNγ+CD4+ T cells had a lower risk to develop CMV viremia after transplantation with a CMVpos donor kidney (relative risk: 0.43, P = 0.03). 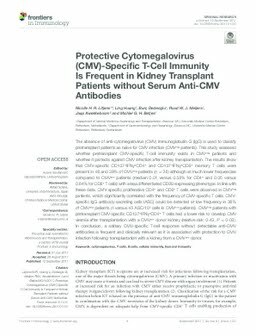 In conclusion, a solitary CMV-specific T-cell response without detectable anti-CMV antibodies is frequent and clinically relevant as it is associated with protection to CMV infection following transplantation with a kidney from a CMVpos donor.